Autumn is one of the most seasons. The crisp air and changing leaves make even a walk through the neighborhood feel like an event. Those leaves, however, have to go somewhere and many of them end up in the gutter. 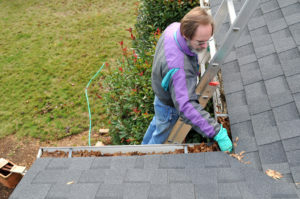 We have a few helpful gutter cleaning tips to keep you safe and prevent property damage. Of all the gutter cleaning tips, letting a friend, family or neighbor know what you’re doing is the most important. It is helpful to have someone check up on you. Also, make sure to have your cellphone somewhere near you in the unlikely event of an accident to easily call for help. Using a sturdy ladder will keep you safe. Before stepping onto the first rung, check to see that the hinges are completely open and that the ladder is in good shape. A four-legged ladder is easy to transport and use for a single story home, while a two-legged extension ladder is the best choice for homes with multiple floors. A ladder can get heavy, so if you have a heart condition or other health issues, know your limits and ask for help moving it around your home. Don’t try to use metal gardening tools, as they’ll only scrape and potentially damage gutters. 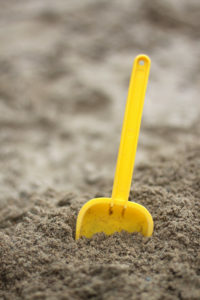 Instead, pick up a small plastic scoop or a kids’ sand shovel.The trick isn’t to try to remove all of the leaves and other debris at once, but remove a little bit at a time. This will lighten the load of each sco and save your back. When done clearing out the muck from the gutters, take a garden hose and finish the job by flushing them. They don’t have to be squeaky clean. Simply remove any debris left behind. 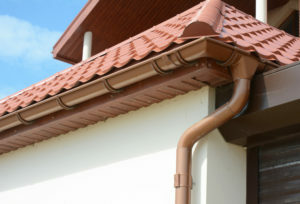 Flushing out your gutter will also make any leaks obvious. Although it may be tempting to call a professional to repair leaks, it may be easier to take care of it yourself. Just snip a piece of sheet metal to fit over the hole. Then, using a large putty knife, spread roofing cement around the edges of the hole. Position the newly cut metal over the hole (from the inside of the gutter) and press its edges into the cement. 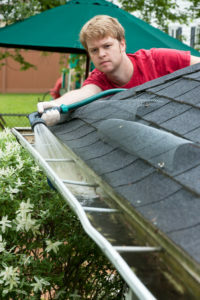 Although cleaning gutters isn’t a lot of fun, it’s an important job that needs to be done regularly. 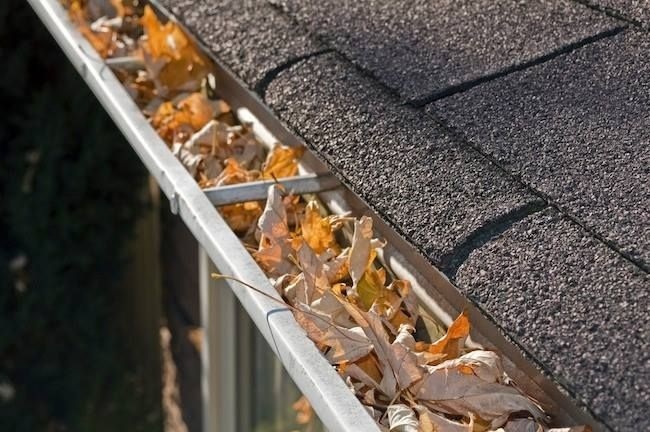 While some people advise cleaning them once a year, one of the best pro gutter cleaning tips is to clean them out at least twice a year, in spring and fall.